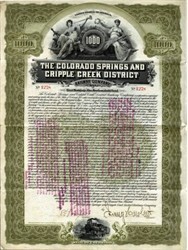 Beautifully engraved certificate from the Colorado Springs and Cripple Creek District Railway Company issued in 1902. This historic document was printed by the American Banknote Company and has an ornate border around it with a vignette of allegorical women. This item is hand signed by the Company’s President (Irving Howbert) and Secretary and is over 112 years old. There are 22 unused coupons attached on the right side. Minor wear. "Next to General Palmer, Irving could be called the man who made Colorado Springs." He had more knowledge than anyone else of the region. In 1869 Irving was elected the clerk of El Paso County, then re-elected to four consecutive terms. Irving was an original member of the Directors of the Colorado Midland Railway. He secured passage of a law remodeling the School for the Deaf and Blind. He was an organizer of the city's first street railway. He also helped build the First National Bank of Colorado Springs. He and two other friends built the Colorado Springs Opera House. He helped realize dreams of an extensive city park system. Howbert laid the foundation for today's Gold Camp Road. He was also a State Senator. Irving also helped Colorado Springs to establish it's park system. Also, Howbert helped organize Colorado Springs' Chamber of Commerce. Irving Howbert was born in Columbus, Indiana, and he was one of the earliest settlers in the Pikes Peak Region. He came to Colorado in 1960. He is sometimes said to be "The greatest pioneer next to General Palmer." Irving Howbert died in 1934. 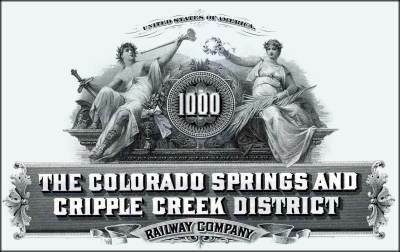 The Colorado Springs & Cripple Creek District Railway (CS&CCD - The Short Line), constructed in 1900 as a 45.8-mile route, ran between Colorado Springs in El Paso County and the Cripple Creek-Victor Mining District in Teller County, Colorado. Converted during the early 1920s to an auto toll road known from 1924 through 1939 as the Corley Mountain Highway, the route travels on top of the earlier rail bed along approximately 90% of its length, except for one section bypassed during the 1 920s around collapsed Tunnels No. 7 and 8, and at short bypasses at a small number of former trestle locations. The road is narrow and unpaved, and has been hailed for a century as an engineering achievement and enjoyed by generations for its scenic vistas and recreational opportunities The Colorado & Southern owned nearly all of the stock. January 4, 1900, Irving Howbert, President of Colorado Springs & Cripple Creek District Railway Company turned the first shovelful of dirt. March 23, 1901 Golden spike ceremonies in Cripple Creek. April 8, 1901 operations began.